Benin, like other countries of the African continent, attracts terminators with excellent conditions for terminating traffic. If you install VoIP equipment in Benin and connect the router for voip, you can make over $250 from one channel. To obtain a high profit from the terminating GSM traffic, it is important to choose the appropriate tariff plan. 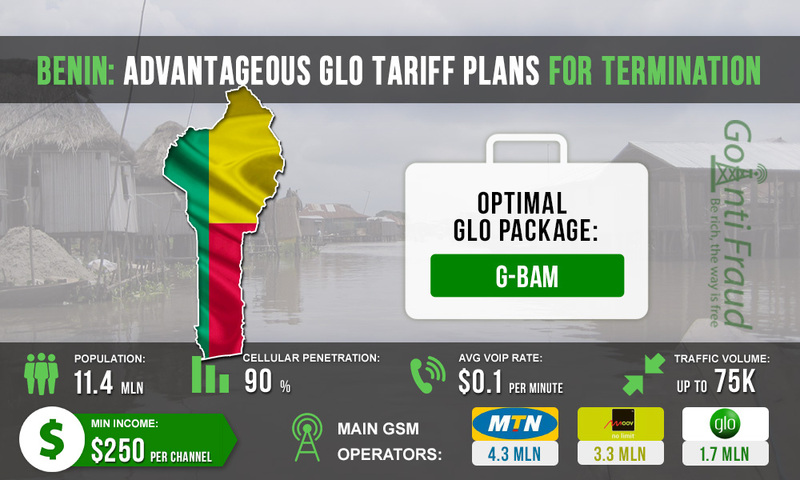 Globacom is one of the 3 largest mobile operators in the market of Benin. The subscriber base of the company totals about 1.7 million people. Profit Max. When you top up $17, a 15% bonus is added. One minute of pf the on-net call costs $0.07. Hwendo. The first two minutes of calls are charged at $0.1, then there is a reduced rate for on-net calls - $0.04 per minute. Every day from 1:00 p.m. till 3:00 p.m. the discount for calls from Glo to Glo is 50%. Glo Gista. After the first minute of the call, calls are charged at$ 0.06 per minute. You can call for 5 selected numbers $0.04 per minute. Every day from 1:00 p.m. till 3:00 p.m. the discount for calls from Glo to Glo is 50%. Classique. Provides a standard tariff for calls - $ 0.1 per minute but the first 5 minutes are for free. You can call 5 selected numbers for $ 0.05 per minute. G-Bam. For 26 cents a week, the subscriber gets 500 free minutes upon activation and the ability to call Glo on Glo for $0.1 per minute. The optimal choice to make money is the G-BAM tariff plan. If you connect to it, you can make outgoing calls almost for free. The cost of one SIM-card is about 50 cents, so you can use 500 minutes a day and buy new numbers. Accordingly, your income with the G-BAM package can be over $900 per channel if you apply a competent approach to protecting SIM-cards from blocking.